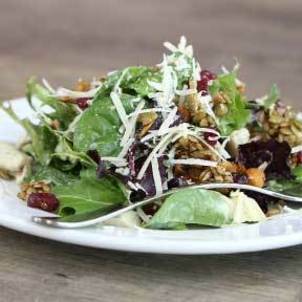 Amazingly fresh and exciting salad combinations! 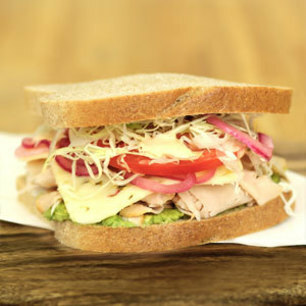 All topped with our simple and delicious house-made dressings. An amazing flavorful mix of greens, chicken, spiced seeds and nuts, roasted chickpeas, golden raisins, and Parmesan cheese, topped with our dreamy house-made avocado goddess dressing. loaded with fresh veggies, interesting toppings and amazing house-made dressings. Choose from our Sesame Chicken, Sesame Portobello, or Fresh Seasons Bowls! 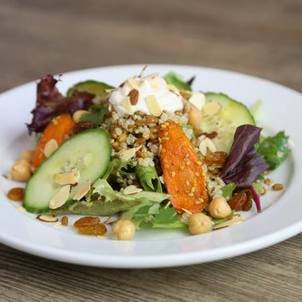 The roasted carrots are the star of this dish, along with mixed greens, chickpeas, cucumbers, golden raisins, almonds, and cilantro. Tossed with toasted whole wheat, quinoa, our house-made red winde vinaigrette, and topped with our Tahini yogurt dressing.